THE strong, athletic, attacking half-back flanker has become an essential cog in just about every footy team in the country, no matter the standard or even age group. Down at the Western Jets, Connor Menadue has made the position his own. 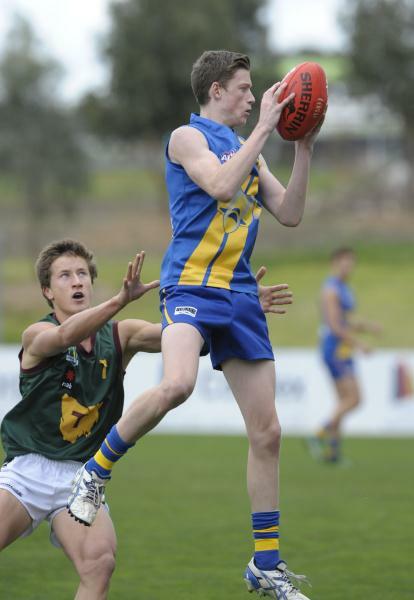 The 17-year-old has enjoyed a dream start to his top-age year in the TAC Cup, opening the season with back-to-back best-on-ground performances against the Calder Cannons and Sandringham Dragons. In his first four appearances for the season Menadue averaged more than 24 disposals a game and has consistently drawn praise from coach Torin Baker week in, week out. “We’ve mainly played him off the half-back line, that’s where we think he plays his best footy but he’ll be given opportunities to play through the midfield and even up forward,” Baker said. Menadue himself is happy with how he’s progressed after playing 15 bottom-age games for the Jets in 2013, and hopes his form will warrant selection for Vic Metro later in the year. “I think I’ve had a pretty good, consistent year so far,” Menadue told Star. As a junior down at the Spotswood Football Club Menadue made a name for himself and was plucked from the Woodsmen as a forward, but has since developed into one of the standout running defenders currently going around in the TAC Cup. Like his coaching staff, Menadue now believes his talents are best suited in the back half of the ground, but naturally, he still fancies himself as a dangerous forward option, too. “I think that off the half-back flank so far this year I have been able to show my run and carry and run off half-back, and also I’ve been able to find the ball,” he said. “But I also think if I did start to play more regularly in the midfield I could start to find the ball even more and then hopefully become a bit more dangerous up forward as well and use my speed there.